Come stay with us amidst old world luxury. Theodore Roosevlet has been a guest at Bischwind and was welcomed with the same hospitality that is offered to guests of today. Baron's breakfast with a choice of filet mignon or filet of salmon are served in the Presidential Dining Room before a crackling fire. Be it a romantic interlude or an executive conference Bischwind has the desired ambience. Bear Creek Village surrounds a lake set like a solitaire gem held in mountain prongs. Skiing, golf, Steamtown, a real coal mine organized for visitation are all nearby. The area is an antique collector's paradise and three state parks are within a half hour's ride. Allow us to replace your cares with our care. Bischwind is an elixir for a frantic world. Directions: From New York: Route 80 West to Exit 284, Blakeslee/Wilkes Barre. Take 115 North toward Wilkes Barre. After 1 mile, you will come to a 4-way light; continue straight on Route 115 North. In approximately 10 miles, you will come to a flashing yellow light; continue straight for another 1.7 miles. Driveway will be on the right (driveway entrance has 2 stone pillars with domed lights). From Philadelphia: Take Route 476, Northeast extension of the Pennsylvania Turnpike to exit 36, Bear Creek. Turn right onto 115 South. Bischwind will be 3 miles on your left. From Southern Cities (Baltimore, Washington, Harrisburg): Go north on Route 81 (toward Wilkes Barre); take Exit 170A (Bear Creek). Take Route 115 South. In 4 miles, you will pass the Pennsylvania Turnpike on the right; continue straight for 3 miles. Bischwind will be on the left after the waterfall. From Connecticut and points East: Take Route 84 West (Scranton), then take Route 81 South. Take Exit 170A (Bear Creek). Take Route 115 South. In 4 miles, you will pass the Pennsylvania Turnpike on the right; continue straight for 3 miles. Bischwind will be on the left after the waterfall. 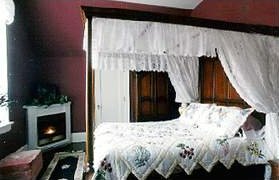 This and other Poconos Bed and Breakfast Inns can be found here in The Register.